Kamasi Washington is an American jazz musician based in Los Angeles, CA. Born into a musical family, Kamasi began playing saxophone at the age of 13, later attending the prestigious Hamilton High School of Music followed by UCLA. He has toured and recorded with the likes of Snoop Dogg, Rapahel Saadiq, Kendrick Lamar, Gerald Wilson, Lauryn Hill, Mos Def, Harvey Mason and Chaka Khan, to name a few. 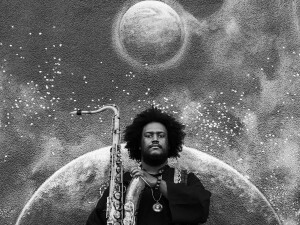 Along with his own 10-piece band, “The Next Step,” Kamasi released his groundbreaking solo album, “The Epic,” on May 5th, 2015. The 172-minute, triple disc masterpiece, which includes a full string orchestra and full choir, debuted at #1 on several iTunes Jazz charts, including the US, Canada, Australia, Russia and UK. In addition to composing his own music, Kamasi is part of a west coast musical collective called the “West Coast Get Down.